There is a long list of well regarded comedies which I have not seen. 40-YEAR-OLD VIRGIN was on that list until now. This was a Judd Apatow movie before that meant anything to anyone. Now nearly a decade old, how is it? I watched THE 40-YEAR-OLD VIRGIN (2005) on 7.9.14. It was my first viewing of the film. A whole series of current stars populate THE 40-YEAR-OLD VIRGIN before they were famous. Steve Carell stars as Andy, the virgin of the title. The movie is kind to him, those who laugh at him are not celebrated. His buddies are Seth Rogen, Paul Rudd, and Romany Melco. Some of the women pursued by Andy are played by Leslie Mann, Elizabeth Banks (who excels), and Catherine Keener. Jane Lynch is the tough boss. Both Kevin Hart and Jonah Hill have a cameo as a customer. Mindy Kaling has a cameo as an ex. Kat Dennings shows up as someone’s kid. This is a movie about a guy trying to get laid. So it is much like many comedies that have come before it, only this time the guy is older. The key to it working is that Carell’s Andy is immensely likable and he is someone we want to see succeed. While the movie does suffer from a touch of misogyny, it allows the main love interest (Keener’s Trish) to be elevated above all of that. She isn’t objectified like some of the other women in this film, she is a fully realized character with her own presence. A good comedy needs classic scenes. This has a couple. 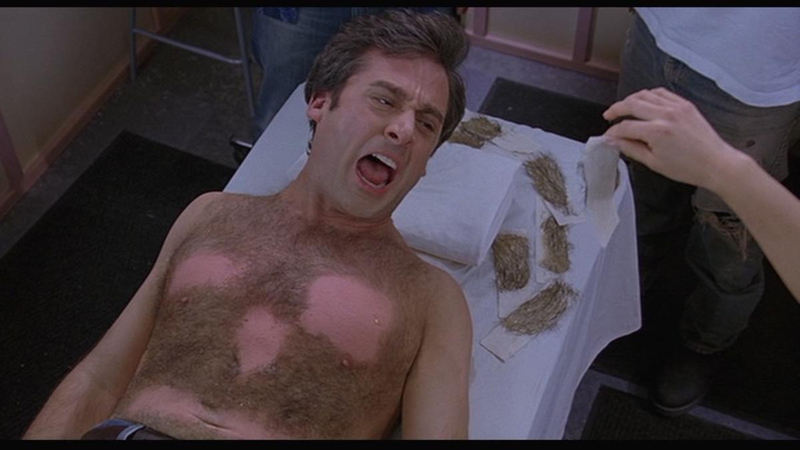 The waxing scene is one, proving that anticipation is as funny as payoff when done right. The innocence of the condom scene is another one which lands strongly. There are also some moments that aren’t as funny as they think they are. While Leslie Mann is someone who is usually excellent, her drunk driving scene doesn’t work effectively. It feels cliched and obvious. The old ethnic man who talks dirty is also a cheap series of jokes which never really work well. The ‘you know how I know you are gay’ scene is one of those things where the actors clearly riffed and they picked the best, only the laughs really aren’t there. But, really, when we get down to discussing a comedy the question is: Does it make you laugh? THE 40-YEAR-OLD VIRGIN succeeds on that level entirely. It’s a funny movie which gives regular laughs. The fact that so many people, even small roles, eventually became comedy stars is a bonus which aids the movie because sometimes people with two lines are legitimately funny people. The performances in this are quite strong, to be honest, particularly in the way Carell expresses his vulnerability. Comedy, they say, is harder to do well than drama. The fact that this is a movie with honest characters is a surprisingly refreshing revelation. This is a movie which has a good heart. While there is certainly some ego in some of the characters, those who are guilty of that (Andy’s three main friends) do the right thing when push comes to shove. Maybe the ‘problem’ at the end is a bit cheap, and maybe the resolution is too easy. But it does not matter. Everyone is likable, everyone is funny, and this is a comedy which hits the proper notes. ~ by johnlink00 on July 9, 2014. Good review John. This movie always has me laughing no matter how many times I see it. The funny, for me, is not beginning to end non-stop. But there is a ton of it. And when it hits, it is top level funny. I liked this movie but I could have done without two things: the musical number at the end and…… Jane Lynch…. At least the musical number was short!